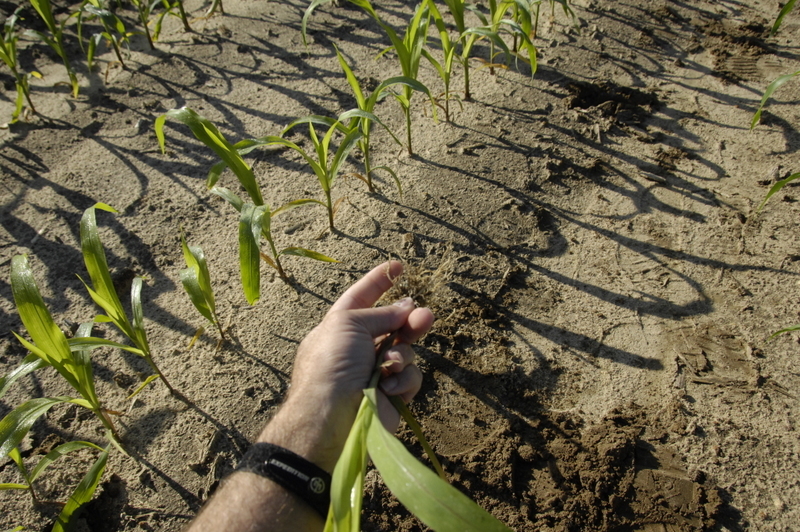 The revised Crop enterprise cost estimates from UGA Ag Econ are now posted at this link. Last week I had a photo of an azalea leaf with knots on it and it was Azalea Leaf Gall. We see it when the rains come just right and the innoculum is present. It’s not usually a big problem, you can pick them off and dispose of them. This week I was looking at some Bahiagrass planted in a silvipasture situation and there was some of this growing there. What is it and what makes it interesting? We are seeing some nematode affects on corn again this year. I haven’t seen as many cases as last year when the corn growth was slow and it rained more earlier but we still have nematode problems this year too. 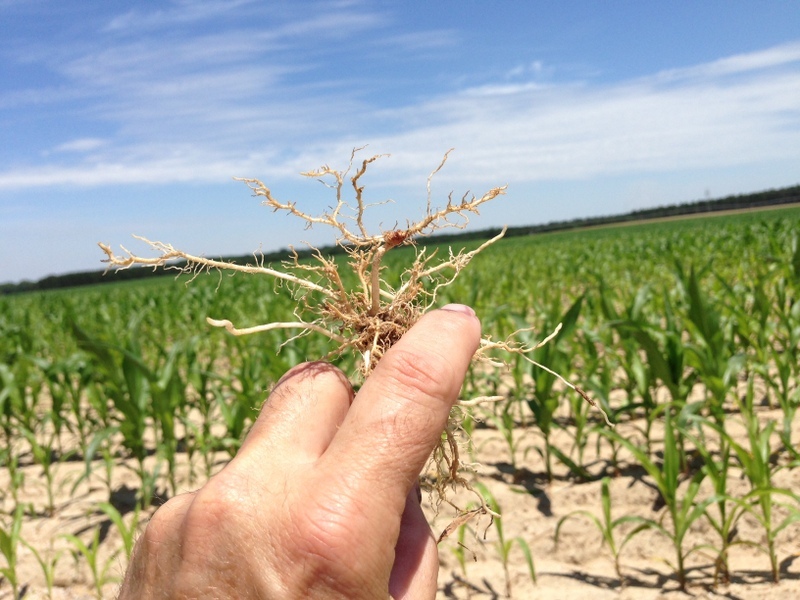 The site below had Stubby-Root nematodes that showed up in the soil sample. They usually occur in areas of the field. This field had corn in it last year so a low population may have increased due to the lack of rotation and a nematicide was not used this year. Here’s a link to a UGA Page concerning these pests and an excerpt below. “Stubby-root nematodes, Paratrichodorus (or Trichodorus) spp. 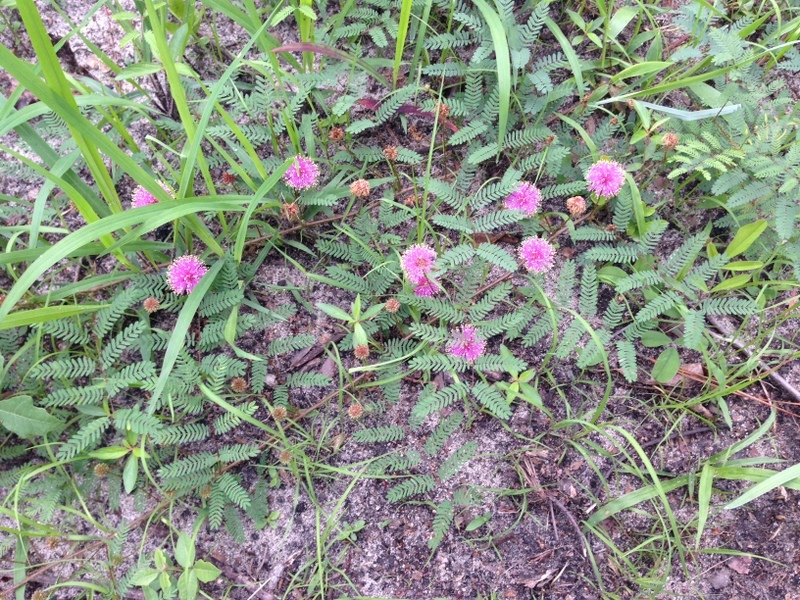 are widespread in Georgia. 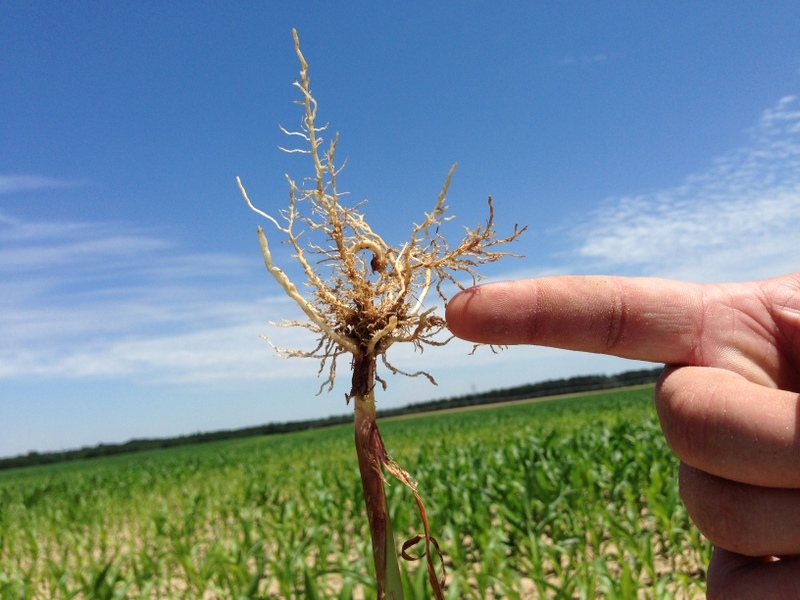 Stubby-root is the most damaging nematode of corn because corn is highly susceptible and these nematodes are so widely distributed in coastal plains soils where much of the corn is grown. 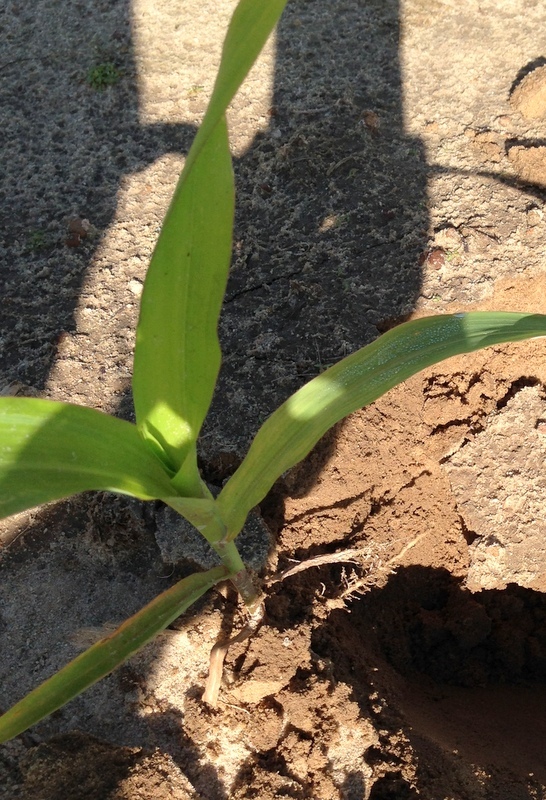 We are seeing several cases of some corn plants breaking over, I’ve looked at a couple of fields and had calls about others where this is happening on a small scale. It’s not happening to large numbers of plants in the fields I’ve seen, just a few plants here and there. The plants are laying towards the northeast, the direction the recent winds would have blown them and I think that’s what happened. The plants have been growing fast and have had a lot of water and break off quite easily if you kick one, so I think the wind did it. We have had some areas of high winds recently, especially towards the Alabama line. In the past I’ve seen some of what we call green snap at a later timeframe, just before tasseling but it occurs at this stage (V6) too sometimes, just as the growing point is getting above the ground. 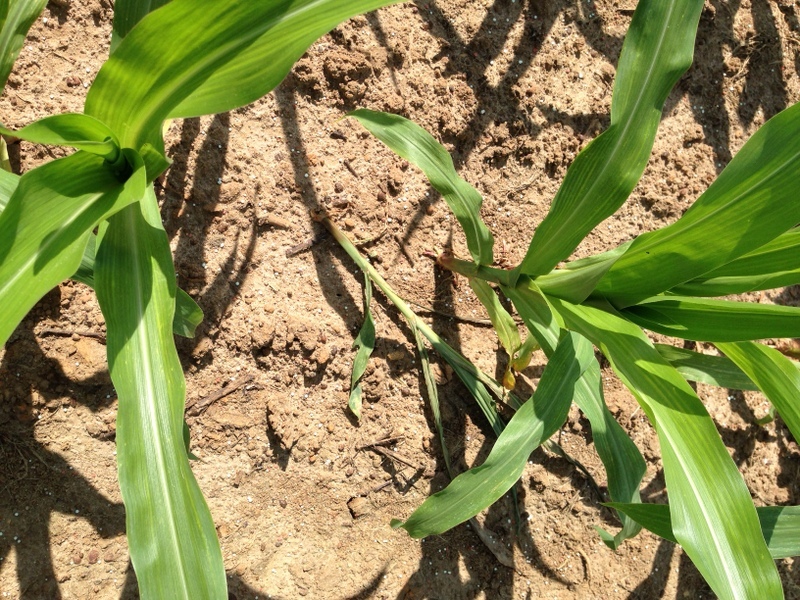 The two most common periods for green (or brittle) snap damage are V5 to V8, when the growing point is just advancing above the soil line, and V12 to R1, or two weeks prior to tasseling until silking. I checked for insects to make sure, and see none. 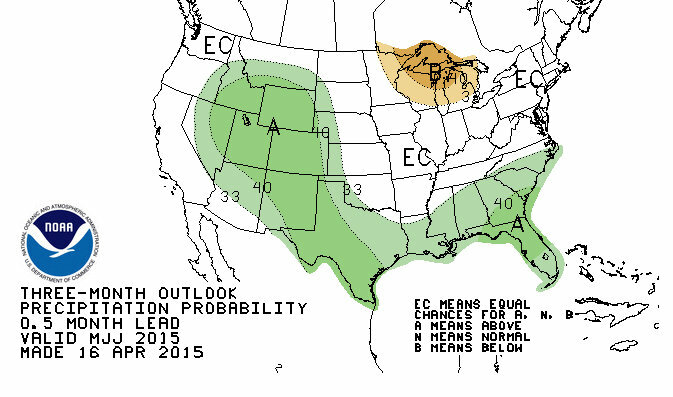 4) July and August are tilted the other way and could be dry (like last year). The above are comments by David Zierden, Florida State Climatologist. 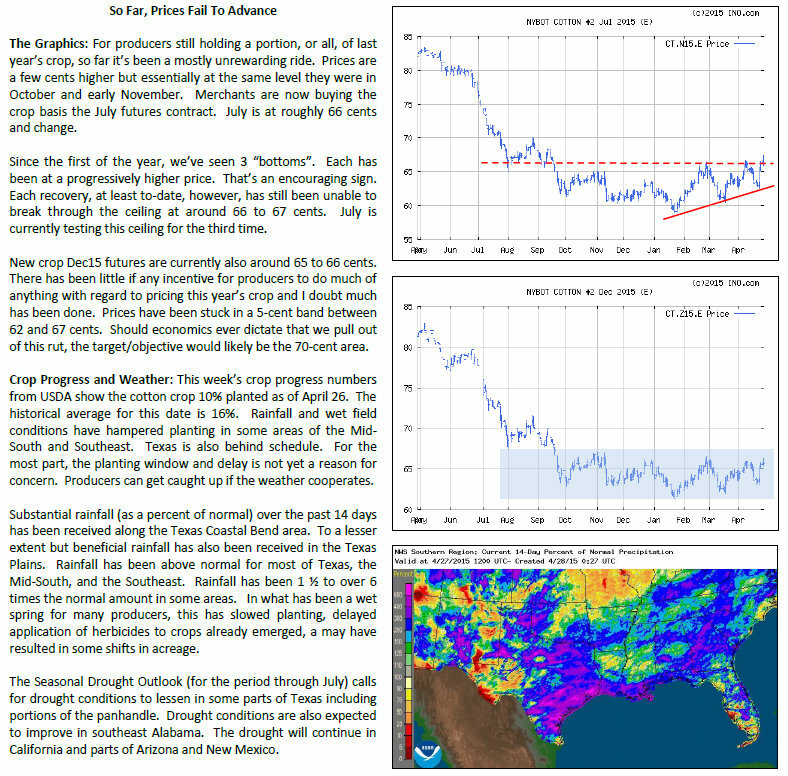 Here’s an link to an informal discussion of the strengthening El Nino and what it means to our area this summer. 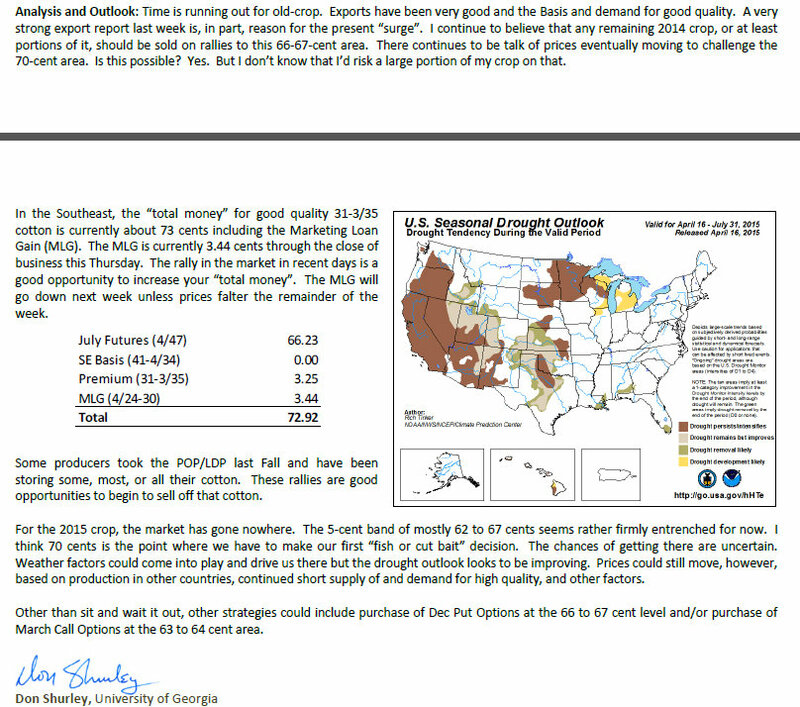 Here’s a good write up by County Agent Bill Tyson concerning Peanuts. Click to go to his Bullock County Ag News. The Marketing Year Average (MYA) price for peanuts is calculated from August 1 – July 31 using National Agricultural Statistics Service (NASS) prices. That being said, we are about 75% of the way through the 2014 marketing year. The Farm Service Agency (FSA) has a Projected 2014 PLC Coverage Payment Rate on their ARC/PLC website. The MYA price for peanuts from this source has the price at $430/ton for peanuts, which has not changed since November. Another source to get the MYA price for peanuts is NASS’s Quick Stats database and it has the current MYA price at $426/ton. However, this average only includes August through December prices for peanuts. NASS publishes weekly peanut prices in their Peanut Prices report (not to be confused with FSA Weekly Posted Price for peanuts). Looking at published weekly prices of peanuts since August 1, 2014 through last week brings the MYA of peanuts to $438/ton. The only peanut prices from this source that is not included for each week are those values not published due to individual buyer disclosure concerns. Dr. Nathan Smith has put together a spreadsheet that includes the published peanut values for each week since August 2014. 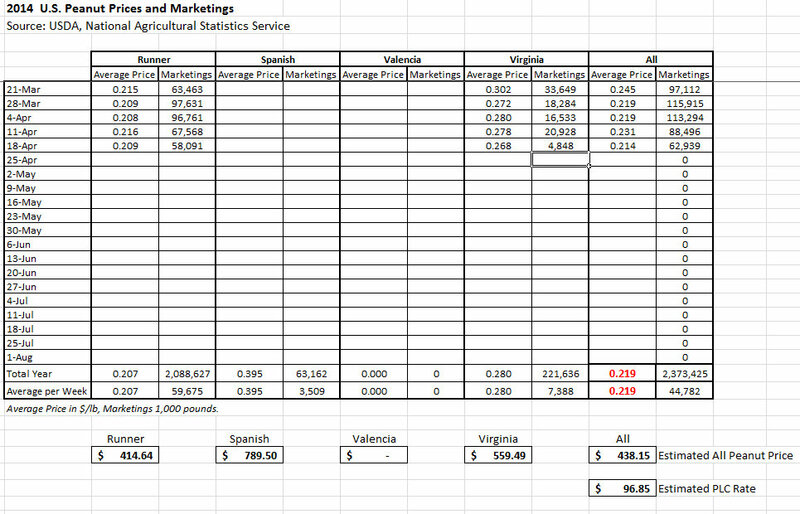 This spreadsheet will be fairly close to the value FSA will use to determine PLC peanut payments for 2014. The only values not included in spreadsheet are those that are not published. Link to it here. $96.85/ton is the current estimated PLC payment for peanuts. The final payment rate for 2014 will not be determined until after July 31, 2015. Payments for the 2014 production year will not be paid by FSA until October 2015. UGA Ag Economist, Nathan Smith , has some good information about Peanut Economics. Most Georgia producers have made their ARC/PLC program elections and the farms with peanut base and/or generic base likely chose PLC for peanuts. The US marketing year average (MYA) price for the 2014 is given as $0.213 per pound or $426 per ton on NASS Quick Stats database but it reflects prices reported only through December 2014. When you take the weekly sales by type and weight by marketings, you come up with $438.15 per ton through the week of April 18, 2015. Using this estimate, the PLC payment rate for 2014 is projected to be $96.85 per ton. 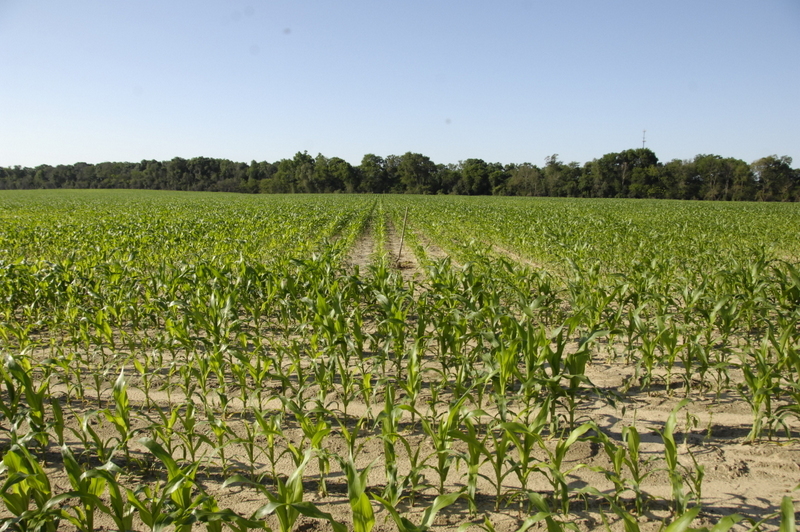 The payment per acre received will be adjusted by a payment factor of 85% as well as an expected sequestration rate. 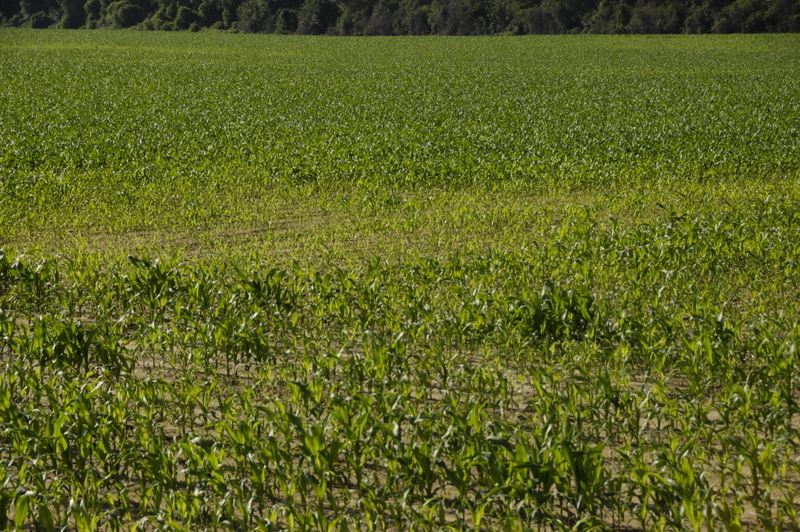 Some large farms will likely hit the new payment limit of $125,000 per person or legal entity. For the 2015 crop year, contracts offered were lower than last year so it is assumed that the PLC payment rate for the 2015 crop will be at least as high as the 2014 rate and probably higher. The payment limit can play a role in peanut planting decisions during periods of very low prices because without the PLC payment, the peanut price received by a farmer could end up somewhere between the $355 loan rate and $400 per ton. The 2014 Farm Bill establishes a maximum dollar amount of Title I program payments that can be received annually (crop year), directly or indirectly, by each person or legal entity. A person or legal entity can accumulate up to $125,000 for all covered commodities except peanuts. Peanuts have a separate but equal payment limit of $125,000 per person. A spouse is also eligible for a $125,000 limit provided both are actively engaged in the farming operation. Limitations on payments are controlled by direct attribution to a person or legal entity. Visit your local FSA office for actively engaged requirements. The type of payments applied to the limit are those received for the Agriculture Risk Coverage County Option (ARC-CO), Agriculture Risk Coverage – Individual Farm Option (ARC-IC), Price Loss Coverage (PLC), marketing loan gains (MLG) and loan deficiency payments (LDP). Market assistance loan forfeitures to the Commodity Credit Corporation (CCC) are not included in this limit. Reference Price – $435 National Marketing Year Average Price), the PLC payment would translate into a $79 per acre payment. The farm with 1000 acres of peanut base would hit the payment limit if its average PLC payment yield is greater than 3,172 lb/ac. At 500 bases acres, the limit would be reached at 6,345 lb/ac. 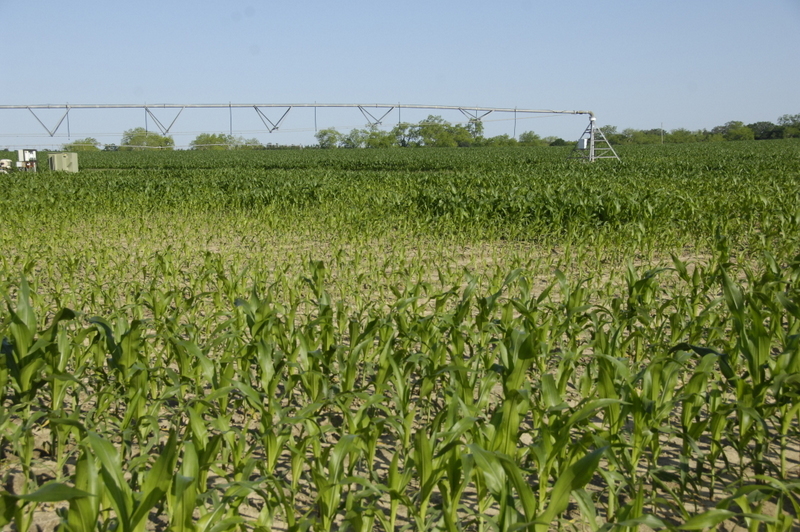 The $100 PLC payment rate is a reasonable estimate for 2014 crop year. There could be several farms that will bump up against the payment limit depending on their payment yield. For 2015, the PLC payment rate could be higher (lower MYA peanut price) so the number of base acres to reach the payment limit will be less than 2014. Assuming a $400 average marketing year price in 2015 would result in a $135 per ton PLC payment rate. The scenario of 500 acres of peanut base and 500 acres of peanuts planted and allocated to generic base lowers the PLC payment yield to 2,350 lb/ac average to max out the payment limit. Assume the farm has a 4,000 lb PLC yield, the payment limit would be reached at 793 acres of base. If for some reason peanut prices dropped to loan rate of $355 per ton, then the payment limit for one person would be hit on 1000 acres at 1,763 lb/ac. Using the 4,000 lb PLC yield the payment limit would be reached at 441 base acres. 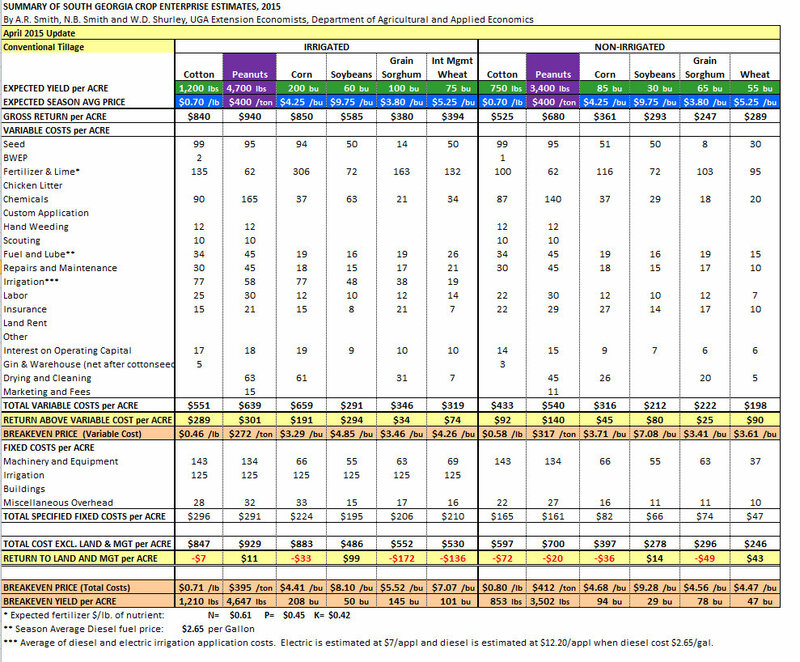 Since the farm’s PLC payment yield is fixed for the life of the farm bill, the tables below show the total base payment acres (peanut base + pro-rated peanuts planted on generic base) to reach the $125,000 payment limit. The acres are adjusted for the 85% payment factor and a sequestration estimate given PLC payment rates for $435, $400, $385 and $355 per ton MYA price and PLC payment yields of 2,500, 3,000, 3,500, 4,000, 4,500 and 5,000 lb/ac. The main message is if a farmer has a significant peanut base on a farm and the farmer plans to plant a lot of peanuts on a farm in 2015, the farmer may be at risk of leaving significant payments on the table because of maxing out the payment limit. The end result would be having grown several tons of peanuts that ended up with a lower price than expected. A spreadsheet developed by the Stanley Fletcher, National Center for Peanut Competitiveness, is posted on the Georgia Peanut Commission webpage and UGA Peanuts webpage that will help a farmer estimate the program payments and effective price of peanuts. The spreadsheet will calculate the number of entities required given the average peanut price received on production, PLC payment yield, generic acres with peanuts planted, and expected yield. For example, assume the average price offered for peanuts in 2015 is $385 per ton. Next assume the national marketing year (season) average price for peanuts ends up at $415 per ton. Farm 1234 has one entity, 500 acres of peanut base, a 2 ton PLC payment yield, 500 acres of generic base allotted to peanuts, a 2.5 ton expected peanut yield, and 750 acres of peanut planted on the farm. In this case the farm would be leaving $64,108 of payments on the table and average $399 per ton effective price for the peanuts produced. The farm needs to add an entity, such as adding a spouse and the result would raise the payment limit to $250,000 for the farm and increase the effective price to $427 per ton. The other important consideration for payment limits is the potential of marketing loan gains (MLG) being applied to the payment limit. If prices are low due to a large supply, it’s possible the National Posted Price (NPP) for Peanuts could drop below $355 per ton. The NPP is the repayment rate for the marketing loan for peanuts. If the NPP falls below $355, say to $325, then a marketing loan gain of $30 per ton is realized if the loan peanuts are redeemed at $325. Besides getting a 1099 form come tax season, the $30 MLG will be applied to the payment limit. In the case above, the $30 MLG is based on the expected yield and total planted peanut acres, resulting in a $67,500 total MLG. This would put the farm above the total payment limit by $6,608. To keep from leaving money on the table in this case, another entity is needed or additional quarter or third at least. Ownership interest for direct attribution of payments is based on ownership interest that a person or legal entity holds in a legal entity on June 1 of the current year. So, to add an entity with ownership interest, it needs to be done by June. Check with the local FSA office to determine how to add a spouse, partner, or member of a legal entity. 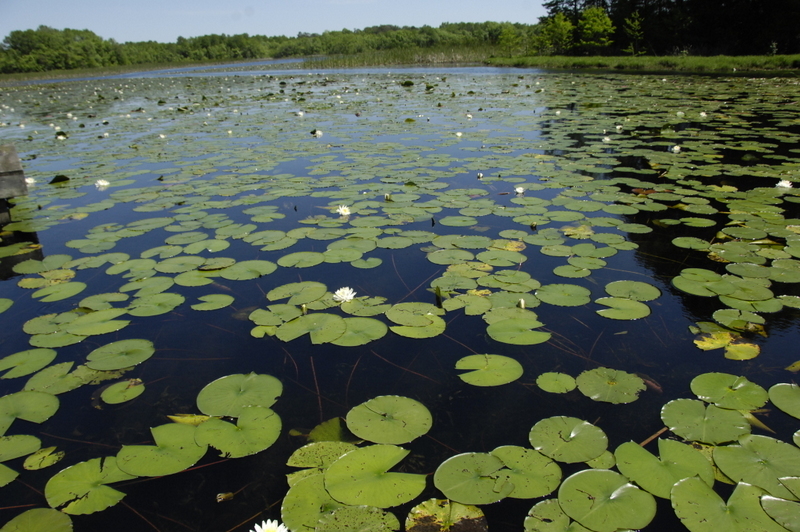 Dr. Gary Burtle, UGA aquatic scientist, will be here to talk about pond management on Monday evening, April 27th at 7:30 pm, in Donalsonville. This is a joint meeting of the Seminole County Young Farmers and County Extension. Please call if you plan to attend, 229-524-2326. 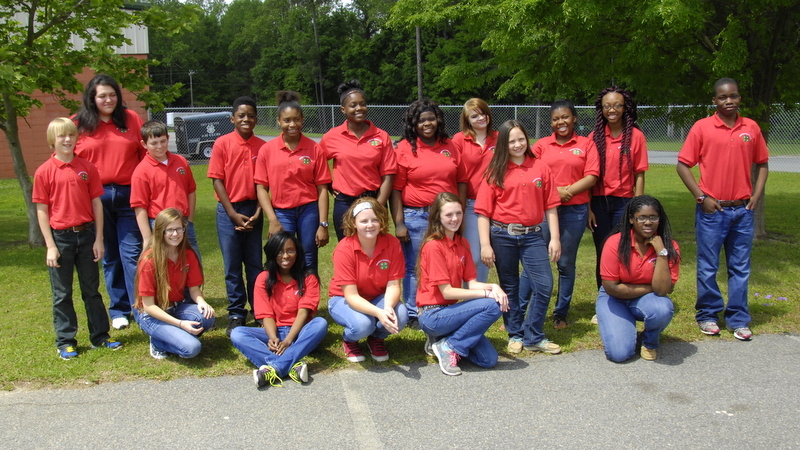 I was very proud of our Seminole county 4-H Poultry Judgers who competed at the regional contest in Tifton, Ga last week. Here they are and we had a Junior team that placed 3rd at regionals and our Senior team placed 2nd and will earned the chance to compete at the State Contest. Well done. We , the top 4 Senior (9th through 12th grade) judges, travel to Athens tomorrow to judge chickens: live layers, ready to cook broilers , and parts; and eggs: candling, exterior quality, and interior quality. I enjoy working with these kids every year.